The Warbling Vireo is a small songbird, grayish on top and whitish on its bottom. But the vireo is more often—or more easily—heard than seen. 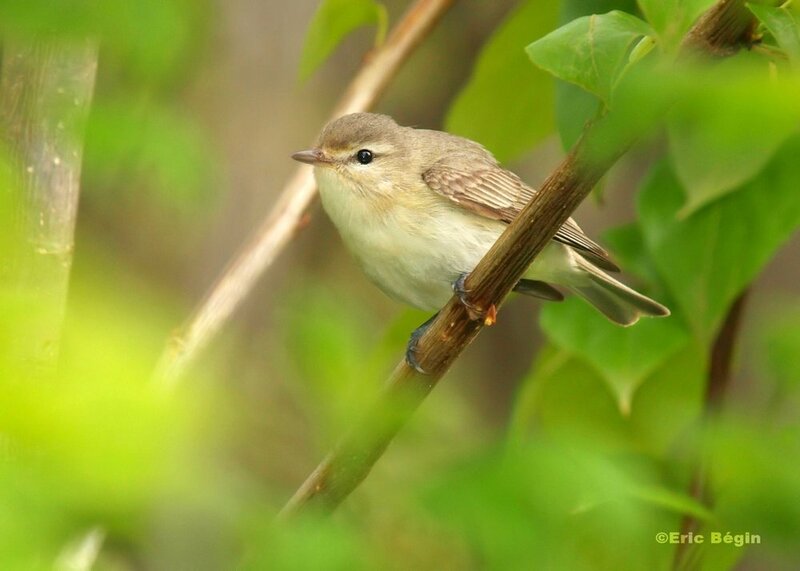 It’s a rising call that birder Pete Dunne called “a happy drunk making a conversational point at a party.” The warbling vireo has a tight migration schedule according to the Wisconsin Breeding Bird Atlas. The first males typically arrive by May 10, while most birds depart mid-August to mid-September. Living in the foliage of deciduous trees during the growing season can make it tough to see warbling vireos. Another sign of the warbling vireo, besides its distinctive call, is its nest, which looks like a smaller Baltimore Oriole nest. Within this nest, female vireos have been known to eject the eggs of parasitic Brown-headed Cowbirds. Warbling Vireos forage for caterpillars, pupae, and moths amidst the tops of deciduous trees. Now is a good time to catch them foraging for plump caterpillars in Buddy’s Black Oak Savanna at Faville Grove. In fall, vireos enjoy native berries like elderberry and poison oak, raspberries and blackberries. The breeding population in Wisconsin and throughout much of eastern North America is stable, or increasing slightly. With such a tight migration schedule, it could be interesting to monitor the phenology of the vireo as our changing climate potentially causes shifts in the leaf-out dates of deciduous forests across North America.